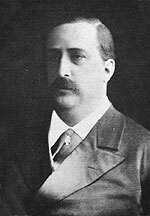 Alexander Borodin was a rarity in professional music – a part-time composer who balanced the demands of his art with an unrelated career. In this appraisal, we note his place among "The Five" who transformed Russian culture, review his career and style, describe his masterful Symphony # 2, survey some of its most significant recordings, and suggest some sources for further information. For obviously selfish reasons, I like to think that amateurs are the real lifeblood of serious musical art. After all, were it not for royal patrons, concert audiences, record buyers and now file downloaders, the efforts of professional musicians would have little opportunity for reward or recognition. Yet, the pantheon of art has no place for mere dilettantes – throughout history the creators whose names still ring bells all dedicated themselves to the demands of music on an exclusive, full-time and all-consuming basis. The most notable exception arose in 19th Century Russia, where the path to the coming political revolution was paved by a cultural one led by a group of young, gifted and rebellious but decidedly amateur composers known as "The Five" or the "Mighty Handful," who sought to defy Eurocentric fashion and academic constraint by developing uniquely Russian music flavored with the jagged rhythms of native folksong and the cadences of the Orthodox Church. The Five were inspired by Mikhail Glinka, who had infused his 1836 opera A Life for the Czar with Russian spirit, psychology, style and folklore, and were led by Mily Balakirev, a despotic, highly opinionated but hugely talented natural musician who saw no need for formal training and tried to mold the others to his taste. Yet despite their enthusiasm and confidence, and notwithstanding the huge influence they would wield, music was their avocation, not their career. In part, their path was cleared by an artistic vacuum. Rosa Newmarch attributes the dearth of full-time Russian composers to the Czar's patronage of foreign artists, which left few opportunities for native art to develop. As for performers, Michael Scott agrees: "The Russian aristocracy, one of the richest in the world, had for long been lavish patrons of Italian opera. Most of the great virtuosi had appeared regularly in St. Petersburg and Moscow earning the largest fees and at the same time receiving the most extravagant plaudits … . [Even] in the far-flung outposts of empire the visit of a troupe of Italian singers was a social event of the first magnitude." As a result, so long as they didn't aspire to fame, Russian amateurs had free reign to create indigenous art free from tradition and the repression of an entrenched establishment. Thus the Five found much fertile but untilled ground in which to cultivate their enthusiasm. Of the Five, Cesar Cui, Modeste Moussorgsky and Nikolas Rimsky-Korsakoff were all military officers, while Alexander Borodin was an acclaimed chemist whose scientific treatises far outnumbered his musical compositions. Although Borodin may have seen his career as a practical necessity, his early biographer Serge Dianin saw an esthetic benefit – as a chemist, Borodin was constantly combining simple elements into complex structures, and Dianin felt that this "combinatory activity" left its mark on Borodin's way of thinking. John Manduell agrees that Borodin developed a strong sense of construction, fashioning "an effortless ability to blend epic and tender extremes in a single breath." Colin Mason opined that Borodin was the strongest of all the Russian nationalist composers, that his mastery of symphonic form was supreme, and that he would have surpassed even Tchaikovsky had he applied himself to music on a full-time basis. But that was not to be. Rimsky-Korsakoff recalled that Borodin was so devoted to his profession that his apartment was adjacent to his university laboratory, and he often interrupted discussion of musical matters by running off to check on the progress of an experiment. Harold Schonberg quips: "How he found time to compose anything remains a mystery." Borodin himself noted with irony that: "In winter I can only compose when I am too unwell to give my lectures. So never say to me, 'I hope you are well,' but 'I hope you are ill.'"
But not all agree that being a spare time composer was a loss. Manduell, for one, asserts that it enabled Borodin to remain relatively immune from others' influence. Perhaps the most extreme support would come decades later from Charles Ives, the remarkable American whose visionary compositions were barely suspected by those who knew him only as an extremely successful insurance executive, and who mused in his 1919 Essays Before a Sonata: "Perhaps the birth of art will take place at the moment in which the last man who is willing to make a living out of art is gone and gone forever. In the history of this youthful world, the best product that human beings can boast of is probably Beethoven, but, maybe, even his art is nothing in comparison to the future product of some coal-miner's son in the forty-first century." Borodin was the illegitimate child of a Caucasian prince who claimed descent from King David and quartered a harp and sling in his coat of arms. Alfred Habets surmises that these legendary roots imbued Borodin with a predilection for the rhythms and modes of the East. In keeping with the practice of the time, Borodin was baptized as the son of a serf, from whom he got his name, and to whose lowly social status he would have been consigned, had he not been freed at an early age upon his father's death and then raised in relative comfort by his mother. Along the path to becoming one of Russia's most renowned chemical researchers and teachers, Borodin established a home laboratory at age 13, practiced medicine for four years, and founded the first Russian academy for the education of women doctors. Music was strictly a pastime – until he met Balakirev, who led him to recognize the creative powers within him and instilled a duty to assert the originality of national art. Borodin was a social creature (he died at a party) with a disordered domestic life, and his concentration was constantly distracted by offering hospitality to relatives, students and frequent visitors. Above all else, the press of his professional duties, and in particular the need to be close to his pupils to guide their work, deprived him of the tranquility needed for composition: "One needs time to concentrate oneself, to get into the right key; otherwise, the creation of a sustained work is impossible." Thus his only (and incomplete) opera is a patchwork of materials added at various stages over 17 years. His lifetime output of complete works is sadly small – along with some songs, a few fine piano pieces, and some chamber works capped by two fabulous quartets, his orchestral work consists of only two symphonies and a tone poem. Borodin's work is unlikely to ever achieve the popularity of Tchaikovsky's, as it lacks the compelling emotion that infuses the latter's final four symphonies (#s 4, 5, 6 and Manfred). Yet, his work is shorter, brighter and immediately appealing, fueled by a vast reserve of creativity that dazzles with its inventive brilliance. In the silence of the monotonous deserts of Central Asia are heard for the first time the strains of a peaceful Russian song. From the distance we hear the approach of horses and camels and the melancholy notes of an oriental melody. A caravan emerges out of the boundless steppe, escorted by Russian soldiers and continues safely and fearlessly on its long way, protected by the formidable military power of the conquerors. It slowly disappears, The tranquil songs of conqueror and conquered merge in harmony, echoes of which linger on as the caravan disappears in the distance. Borodin wrote his first symphony from 1862 to 1867 under the strong influence of Balakirev, who led the 1869 premiere, which was so successful that Borodin was immediately inspired to begin a second. At the same time, he launched his most ambitious project which after 17 years of sporadic effort he would leave unfinished at his death. 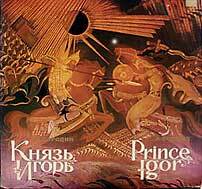 Prince Igor was to be an epic opera to Borodin's own libretto based on the twelfth century defense of Russia from barbarian invasion. As completed and published posthumously by Rimsky-Korsakoff and Glazunov, it is a sprawling compendium of disparate material from stirring choruses to soaring Italianate arias and, most famously, a ballet interlude of immensely tuneful "Polovtsian Dances" that have gone on to a life of their own as light concert favorites (along with an overture arranged by Glazunov, based on his phenomenal recall of Borodin having played sketches to him years earlier). The second symphony and the opera were closely allied. In an 1870 letter to his wife (whose ill health was a boon to scholars, as her long separations for spa treatments generated a bounty of revealing correspondence) Borodin wrote that he already had lost enthusiasm for the opera's heroic/mythic subject and despaired that it would lack requisite drama or movement, yet assured her that the material would not be wasted, as it would be used in the new symphony. 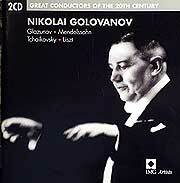 Indeed it was – the Symphony # 2 brims with melody, even though Borodin himself thought the First technically superior. Yet, although it's hard to fathom nowadays, it was the rather pedestrian and largely unmemorable First that opened doors for Borodin in Europe, especially in Germany and Belgium, while the vibrant Second was largely ignored in its time, and in some circles for quite a while since then – it isn't even mentioned in the mammoth 1,042-page 1976 New York Philharmonic Guide to the Symphony compendium. Although he would not resume work on Prince Igor until 1874, Borodin wrote his Symphony # 2 in (for him) a burst of speed from April 1870 to October 1871. Borodin was stepping out from the shadow of Balakirev – as he later explained it, there was no melodramatic "breakup" of the Five, but rather each member developed along individual lines, which he likened to hatchlings growing their own wings after a necessary period of nurture or, in a less kindly comparison, the discovery of mobility after being constrained by braces. In working on the symphony, Borodin was gripped by the spirit of the opera. According to Dianin: "The whole character of the symphony is patriotic. The composer is expressing his sincere admiration for the fortitude and spiritual integrity of the heroes of old, who saved Russia from her enemies, and thus laid the foundation for her future development. He felt an instinctive affinity with this long-vanished epoch of Russian history." In a decidedly mixed review of the first performance, the critic Ivanov wrote that he was "reminded of the ancient Russian knights in all their awkwardness and also in all their greatness." Borodin told the critic Stassov that three of its four movements were meant to depict specific connotations: the first a gathering of Russian warriors and heroes, the third a bayan (a mythical Slavic bard) and the fourth a feast of heroes amid the peoples' exultation. While these associations are rather obscure (except, perhaps, for harp chords that open the third movement and indeed evoke a bard's lyre), the entire work bursts with inspired touches that still amaze with their ingenuity and practicality. Thus, beginning at measure 232 of the rapid finale, in order to enable the strings to keep pace with a blizzard of pizzicato chords, Borodin divides them so that each half is charged with alternate notes, a far more manageable arrangement than if each was responsible for all dozen notes within each second. Early critics derided the irregular sequence of keys, as the movements reflect a progression through the barely related tonalities of b minor, F major, D-flat major and B major. Yet, the work is unified by an extraordinary compatibility of its themes; although the relationships are subtle (far more so than with an idée fixe or in a cyclic form in which the elements recur literally), the themes sound interrelated and go well together. Borodin was also a master of transitions, both gliding effortlessly between duple and triple rhythms and linking seemingly disparate harmonies; thus the third and fourth movements are joined (and played without pause) by bridging their seemingly clashing keys (five sharps to four flats) through a sustained chord written at first as d-flat and a-flat and then as enharmonic c-sharp and g-sharp. In a clear influence on Tchaikovsky's more famous Fourth Symphony (written one year later), the Borodin Second begins with a commanding unison bass fanfare-like motif that will recur at key structural moments in the first movement. Yet, from the very outset Borodin teases our expectations by notating the long notes with fermatas to immediately break the rhythm and create an introduction, as distinct from all the motif's repetitions that occur in regular cadence. He then relieves the sobriety and tension by alternating the motif with a high-pitched jaunty tune and adds a further complement with a gorgeous, flowing melody in 3/2 time, from which the body of the movement is largely derived. All themes but the opening motif have a clear folk-like derivation, and their oriental modes have been credited as a strong influence on Debussy and Ravel. 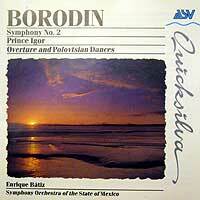 Although barely relevant at the time, Borodin's unusual use of melody is worth considering. Early critics of the Second actually protested a superabundance of themes in the outer movements as a violation of classical constraint. 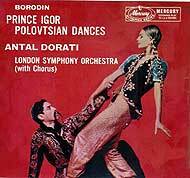 Indeed, Robert Wright and George Forrest were so impressed with Borodin's profusion of fine tunes (mostly from his other works) that they adapted them for all the songs in their hit 1953 musical Kismet. Yet, Jonathan Kramer contends that: "It is amazing that a work with few real tunes should strike us as wonderfully melodic." Philip Ramey agrees that Borodin "was such an incomparable lyricist that he could write affecting music … even with a theme that is not especially memorable." Kramer attempts to reconcile this seeming anomaly by declaring the melodic language to be unique: "Virtually all the melodies are mosaics of cells – too long and with too much individual character to be motives, yet too short and too concentrated to be complete melodies in themselves." (A musical motive is generally defined as the shortest recognizable unique sequence of notes that invites completion through a huge variety of transmutations – think of the opening of Beethoven's Fifth – while a melody is satisfying by itself and can stand alone without a need for expansion.) Borodin's gift (as well as many others') was to strike a balance in crafting building materials that gratify even as they invite development. The second movement, a gossamer scherzo that evokes Mendelssohn, is written in the highly unusual time signature of an extremely rapid 1/1 (marked as 108 measures per minute), so as to suggest constant sprinting momentum without any attempt to temper the relentless pace or emphasis upon the downbeats. (A trio section is in a more conventional loping 3/4 time and relaxed pace.) The emotional core of the work arrives with the andante, which packs a long and variegated aural journey into a single eight-minute movement. It begins with a ravishing horn melody with a loose rhythm that sounds improvised, to which two contrasting elements are added, passing effortlessly through stages of reverie, expectation, release and reflection. With the finale, we again plunge into a world of rhythmic surprise, with a gregarious initial theme that alternates between 3/4 and 2/4 time (and thus actually sounds as if in 5/4, a time signature that Tchaikovsky would popularize in his 1893 Sixth Symphony). A spirited second melody boosts the vitality with unusual percussion accents that reinforce the second beat of 3/4 time. Indeed, Borodin achieves an astounding fusion of duple and triple time throughout the movement, by fluently leading all his material through sections of each rhythmic scheme, and often throwing in odd measures of one into the other, all without interrupting the flow or drawing attention to the device. This technique attests to Borodin's esteem for folk music, authentic performances of which often blur the fixed meters and regular periodic structures of art music. The first performance had to await 1877. While preparing for the premiere, Borodin managed to lose his completed scores for the first and fourth movements and had to recompose them. Perhaps for that very reason, the work sweeps by in a spontaneous, seamless fresh breath, free from the makeshift process with which Borodin created all his other work. Even so, the premiere turned out to be a failure, due largely to the conductor Napravnik's sluggish tempos in an attempt to clarify the heavy brass writing (a flaw which Borodin apparently acknowledged, as he lightened the scoring for a second performance; indeed, the Ivanov review had noted: "There is heaviness even in the lyric and tender passages. The massive forms are at times tiresome; they crush the hearer."). 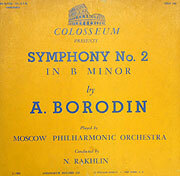 The resulting orchestration has been widely admired; Schonberg states that, although Borodin was heavily influenced by Rimsky-Korsakoff, "who is supposed to be one of the great masters of the orchestra, and he is, his scores sound thick next to the wonderfully articulated sounds and mixtures of the [Borodin Second]." Borodin reportedly intended to make further modifications and corrections before submission to his publisher, but never did, and so the orchestral score was only issued posthumously, and reflected editing by Rimsky-Korsakoff and Glazunov. 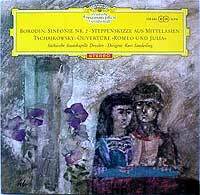 However, Dianin compared the final version with a piano duet arrangement Borodin had prepared at the time of the premiere and found few significant differences. Far more severe issues of authenticity arise with respect to a Symphony # 3. Borodin left only some sketches of the first two movements, which Glazunov realized on the basis of his recollection of the composer's intentions. Scholars familiar with Borodin's style have questioned the extent to which Glazunov injected himself into the completed project, which nonetheless bears a striking affinity with the Second while avoiding any outright mimicry. As published in 1888, the first movement is quite pastoral and the second is another Mendelssohnian scherzo, but with the added technical prowess of being written in flowing 5/8 time; the mood is dispelled by an assertive 2/4 trio whose melody is a variation of the opening theme, thus providing a wonderful integration of the torso. Dianin's book contains a substantial analysis of fragmentary sketches of the remaining movements and suggests that the third was to have been a theme and variations, a highly unusual form for a slow symphonic movement. 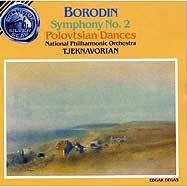 The challenge of recommending recordings of the Borodin Symphony # 2 is both simplified and complicated by the supremacy of one whose level of commitment, inspiration and sheer energy is not approached by any other. But both danger and irony lurk there – after hearing it, all the rest seem sterile and uninvolved, yet it can only be appreciated after familiarity with standard readings. Nikolai Golovanov (1891 – 1953) has been called the "Russian Furtwängler," and rightly so. A visionary conductor who transformed even the most pedestrian pieces with ecstatic fervor (his hyper-dramatic 1812 Overture is frighteningly intense), he was officially written out of Soviet history and forgotten after being purged in 1952 (and he conveniently died the next year). But the past cannot be ignored forever, and his legacy of electrifying recordings has emerged to shatter the neglect of prior generations and to reveal one of the greatest talents to ever hold a baton. Prime among these is a late 1940s reading of the Borodin Second. Despite its unprecedented long overall timing of 30½ minutes, it creates intensity at both ends of the emotional spectrum, as wild tempos range from standstill to recklessly frantic and are constantly varied, even within a short phrase. Indeed, Golovanov constantly distends rhythms by stretching or clipping phrase endings and he ignores the score's dynamic indications, replacing gradual volume swells with startling abruptness and soft fades with hammered power chords. Nor does Golovanov observe Borodin's careful orchestration, underlining the entire opening section with tympani and replacing sustained whole notes with the throbbing tension of quarters. The ensemble (dubbed the "Grand Symphony Orchestra") sounds well-rehearsed and must have been accustomed to its leader's vagaries, as its cohesion never falters despite the many perils of their roller-coaster ride through the reworked score. The playing is razor-sharp, hyperactive and topped with snarling brass. The recording (on a Multisonic CD) is crude with some overload distortion yet clear and powerful, adding to the visceral impact of the unvarnished, spontaneous reading. From the pounding emphatic opening to the huge percussion crashes of the finale, this is one of the most thrilling orchestral performances ever captured on record – a true interpretation in the deepest personal terms, in which every note comes straight from the conductor's heart, leaving an overall impression of a massive collective improvisation by a complex impassioned organism. The Golovanov/Borodin Second (in a sense they really function as co-authors) is an absolutely stunning, incomparable achievement. For me, at least, the awesome sincerity and inventiveness of the Golovanov recording sweep away any concern with authenticity or idiomatic style. Yet, art demands a respect for style, and many other recordings manage to convey the score with both integrity and enthusiasm. Of the two dozen or so that I've heard, I'm limiting the rest of this survey to those I found to be of particular historical importance or interpretive interest. Albert Coates, London Symphony Orchestra (1929–31). Coates was born of British parents in St. Petersburg in 1882, and studied both in England and Russia. 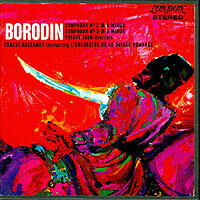 His credentials for this first recording of Borodin's Second were honed by study with Rimsky-Korsakoff (who edited its publication) and Napravnik (to whom the premiere had been entrusted). As a student of Artur Nikish, the most dynamic conductor of his age, Coates's own vitality flourished. The recording sessions were begun in November 1929 but completed only 17 months later. Leaving aside comparisons with the feral liberties of the Golovanov recording, Coates' reading is wonderfully free and spontaneous, departing from the score far more subtly to underline structure and add personal dramatic touches, but all well within the realm of the composer's conception. This approach is announced at the very outset, as Coates takes the opening at a very slow pace, begins the following section rapidly but then immediately slows it down (as if to suggest that he is acting on impulse), adds dramatic deceleration at the end of phrases, and signals the gentle nature of the second theme with portamento (sliding between string notes). Overall, Coates gives us a lovely reading that combines equal measures of musical logic and the conductor's personality. The recording is rich and well detailed for the time and succeeds in conveying the vitality and flair of the performance. Nathan Rakhlin, Moscow Philharmonic Orchestra (1950) – This reading is of the same vintage as Golovanov's but presents a striking yet perplexing contrast. According to the notes on its American LP release on the Colisseum label (which sprawled its 27 minutes over both LP sides), it was "presented here in the true Russian tradition," yet the result seems hugely disappointing. Although the andante is full of charming whispers (at least to the extent that they can be discerned above the considerable surface noise and distortion), and while the outer movements occasionally display a modicum of animation, vast stretches of the score are a stultifying literal walk-through. The direction is at best dutiful, with few hints of enthusiasm or even attentiveness, the playing is mediocre, immediately dispelling any power of the opening chord with a tentative entrance, and the recording itself is awful, barely up to the fidelity of an acoustical disc. Even if Golovanov can be set aside as sui generis, how can Rackhlin's approach be reconciled with the proud Slavic emotive interpretive tradition? Perhaps the answer lies in the authoritarian politics of the time, and its corollary of cultural repression in which artists were expected to serve as dignified exemplars of social rectitude. While such an attitude may work with some music, here the result is deadly dull and seems downright antithetical to the demands of the piece. Ernest Ansermet, Orchestre de la Suisse Romande (Decca/London, 1954) – Ansermet provides a nice complement to the more proactive conductors, as the cover of his LP is far more red-blooded than the performance it contains. 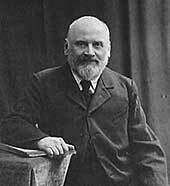 Ansermet had an eclectic reputation ranging from Bach to Bartok and compiled a substantial discography of romantic Russian titles, including box sets of the full-length Tchaikovsky ballets as well as many LPs of then-obscure Rimsky-Korsakoff suites and overtures. Frankly, his bland, almost calculated manner seems to leave a lot on the table, yet his readings serve a useful purpose, as their purity emphasizes the classicism of the works' structures and the rich FFRR recordings shine a spotlight on the accomplished orchestration. Here, Ansermet and the orchestra he founded and led for a half-century imbue the Borodin Second, and especially the scherzo and andante, with uncommon grace, perhaps drawn from Ansermet's vast experience as a ballet conductor. In any event, Ansermet and others prove that a careful, reticent, well-played performance need not be boring. Dimitri Mitropoulos, Minneapolis Symphony Orchestra (Columbia, 1941) and New York Philharmonic (Columbia, 1952) and Nicolai Malko, Philharmonia Orchestra (EMI, 1947 and 1955) – Although there is no dearth of modern recordings, and although neither conductor's readings are particularly distinctive, it's appropriate to salute Mitropoulos and Malko for not only having cut 78s of the Borodin Second in less abundant times but for the added boldness of issuing remakes before the end of the mono LP era. Mitropoulos adds some romanticized phrasing and fires up the finale with unusually prominent tambourine and cymbal (but undercut by mushy tympani). Malko was a student of both Rimsky-Korsakoff and Glazunov and gives tasteful, respectful readings; thus, his pedigree helps to validate speculation that an objective approach truly does convey an authentic Russian interpretive tradition. In any event, his remake is a fine example of the excellent detail and balance of late monaural sound, vastly superior to the dull sonic sludge EMI turned out (at least on American Angel LPs) when it turned the corner to stereo recording. Jean Martinon, London Symphony Orchestra (RCA, 1959) – Martinon presents the other side of the interpretive coin, bringing the work home in a mere 24 minutes with tempos consistently faster than the indications in the score – his opening animato assai is very animato indeed! By suddenly leaping from section to section, he creates a somewhat disorienting feeling of discontinuity. Along with the visceral excitement of the speedy pacing, he constantly pushes the outer boundaries of cohesion yet without feeling unduly rushed or losing the musical sense. In the andante he adheres to a constant tempo that creates a light-hearted tension by constantly straining to press forward. Overall, this is a lively, fresh, youthful romp that leaves any sense of contemplation or even moderation far behind. 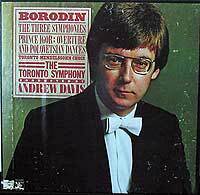 Andrew Davis, Toronto Symphony (Columbia, 1977) and Loris Tjeknavorian, National Philharmonic (RCA, 1977) – 1977 gave Borodin fans cause for celebration with the release of the first two integral sets of his symphonies. 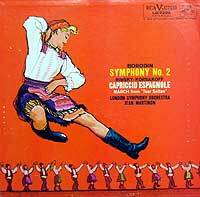 For their ground-breaking releases, Columbia fit the three (actually 2½) symphonies plus the overture and dances from Prince Igor on two LPs, while RCA added a third LP (but priced their set as two) with the Steppes and orchestrations of a piano suite and the nocturne from the String Quartet # 2. The readings of the Second are remarkably similar, with Tjeknavorian ever slightly more animated (and, perhaps reflecting his independence from Russia as an Armenian composer, adding a startling trombone razz to the final climax of the first movement of the Symphony # 1). CDs now routinely squeeze all the Borodin symphonies onto a single disc, but in their time these two sets were pioneering ventures. Enrique Bátiz, Symphony Orchestra of the State of Mexico (ASV, 1984) – It seems fitting to conclude our salute to the great Russian amateur composers with this top-notch performance by a little-known orchestra, which Bátiz founded in 1971 and continues to lead. It's also worth noting that I became aware of this rather obscure CD (and then bought a copy) by skimming through the free 30-second samples on the Amazon.com/music site (a great sales technique that sure works for me! ), where it intrigued me with its sharp, fleet opening which, it turns out, energizes the entire first movement and propels the second as well (at a tempo that flaunts the players' virtuosity; the remaining two are more conventionally paced with a lovely lyrical lilt). Whether due to his (relative among conductors) youth, Latin-American temperament, or a unique personality, Bátiz's crisp, detailed reading ranks among the very best. And whether the thin texture resulted from an undersized ensemble, the early digital technology or aesthetic choice, the clear sonics (reminiscent of "original instrument" forays into earlier work) display each instrument and highlight the orchestration. (And the companion Prince Igor overture and dances gain enormously from tender loving care as well.) But above all else, for me this recording proves that among performers, as well as composers, there's plenty of quality, discoveries, enjoyment and surprises to be found by venturing beyond the tried and true conductors and orchestras with stratospheric reputations. 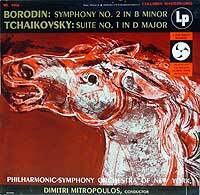 My primary source for biographical information is Serge Dianin's Borodin (Tr: Robert Lord; Oxford, 1963). The author was uniquely close to the composer – he was raised in the Borodin household, as his mother was Borodin's adopted daughter and his father was a close friend who tended to Borodin's affairs after his death. Also important is Alfred Habets: Borodin and Liszt (Tr: Rosa Newmarsh; Digby, Long & Co., 1895; reprinted by AMS Press, 1977), based on (and extensively colored by) an extensive contemporaneous biographical article by the critic Vladimir Stassov; the article by Robert William Oldani in the 2001 edition of the New Grove's Dictionary of Music and Musicians; Gerald Abraham's introduction to the Eulenberg score; and the Borodin chapter by John Manduell in The Symphony (Ed: Robert Simpson, Penguin, 1966). copyright © 1998-2009 Peter Gutmann. All rights reserved.